What you listen to on your way to work is a sacred thing. Sometimes you want the rustling leaves of autumn. Sometimes you want a companion for good conversation about our trade policy with Azerbaijan. But sometimes you just want to slap on your headphones and get lost in your favorite mix of patriotic marches. And that’s fine. Nothing livens up your jaunt to work like a fife. Except, of course, that stuff you didn’t hear: the ambulance siren, the out-of-control delivery truck, the roar of the Bengal tiger that just escaped from the zoo. 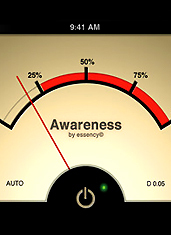 Which is where Awareness: The Headphone App comes in. Think of this as your sonic Secret Service guy. When you launch the app, it’ll automatically note the level of the background noise around you. Then, as soon as a noise exceeds that level (you never know when a fireworks display will break out), the microphone will pick it up and pump it into your headphones. Of course, the sidewalk isn’t the only place this could be useful. In quieter environments, you can set the threshold lower, so it picks up voices. So when your HR director comes to nag you about some dental insurance form, you can politely answer her that you’ll get to it when you can—without missing any of Slash’s guitar solos. The walls of your “Paradise City” can’t be breached.